You would have to be sitting under an exceptionally dry rock to be unaware of the serious drought going on in California. Last year, Gov. Jerry Brown declared a state of emergency, directed state agencies to use less water and initiated an expanded conservation campaign to raise public awareness, among other efforts. But still, it wasn’t enough, so in April he directed the State Water Resources Control Board to implement mandatory water restrictions across California, aiming to reduce water usage by 25 percent. He’s serious about everyone cutting back—and research shows he should be. According to a Geophysical Research Letters study, this is the state’s worst drought in 1,200 years. Guilty as charged—every time there’s a downpour, I sneak a few more minutes into my shower or turn my lawn sprinklers back on. “The problem with the drought is that unlike other natural disasters, we don’t know when the cycle will end,” Christopher adds. To reach the state’s goal, every Laguna Beach resident needs to reduce his or her water usage by 29 gallons a day. Everyone’s water bill displays the household’s budget—if you’re above that number, it’s time to call a family meeting and plan out a few ways to cut back at home and in the neighborhood. 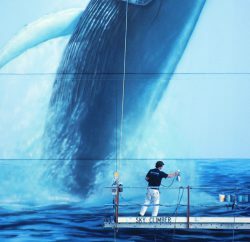 Luckily, creative approaches to conservation can make the effort feel less like a chore. The last drought brought us the low-flow toilets and water-efficient showerheads. Now dual-flush toilets, which use 20 percent less water than standard options, are gaining popularity. One flush level is for liquid waste while the other is for solid. Both low-flow and dual-flush rely on gravity, not water, to remove the waste. But replacing toilets can be difficult and pricey. 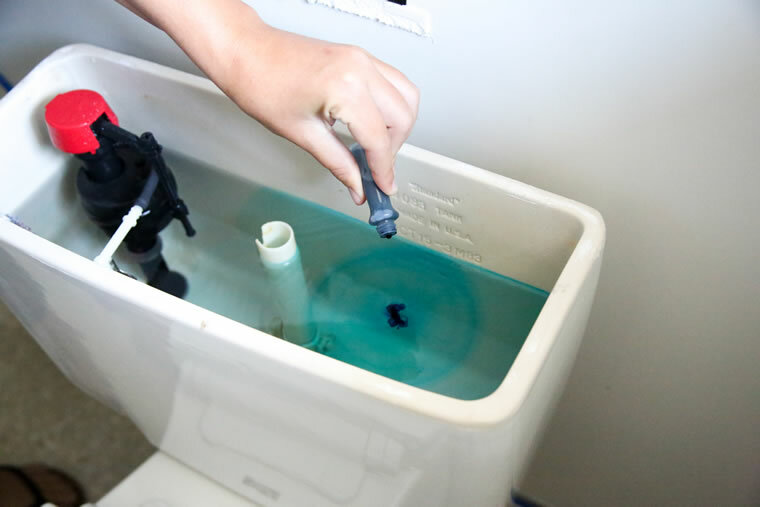 Until you’re ready to upgrade, make sure that your toilet isn’t leaking water with this simple test: First, place about six drops of food coloring in your toilet tank. After about 30 minutes, if it seeps into the bowl without flushing, your toilet has a leak and you’re probably wasting gallons of water. Collecting rainwater from your house gutters can also cut back on water usage. Several years ago, our household started using large plastic trash cans to gather rain at the exit point of our gutters. Now, the Laguna Beach County Water District will give you up to four rain barrels for free (based on supplies and eligibility). You can turn the kids loose with some paints to decorate the barrels for a fun family project, or invest in the decorative models on sale at the district office. 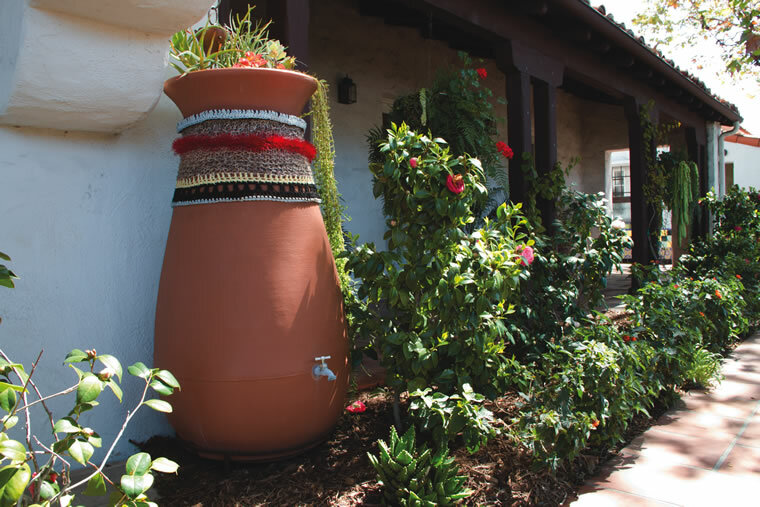 The water district also holds an annual Roll Out the Rain Barrel Contest that prompts residents to create original art designs for barrels; the winners are displayed downtown in May. Whether you exercise your artistic skills or not, you’ll enjoy the savings when the rain arrives and you have free, fresh water for washing the dog, a kiddie pool and your new succulent garden. “During this drought, we need to focus our efforts on reducing water usage on gardens or turf,” Christopher says. These are often the main source of our water waste. 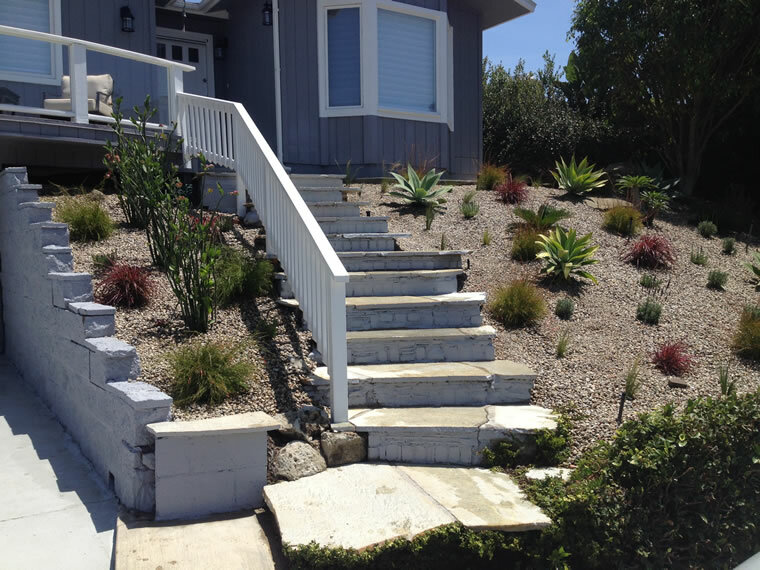 Xeriscape, a 1970s term that used to mean landscaping with gravel and cacti, has now morphed into the attractive and much-needed landscaping trend that incorporates native drought tolerant plants. 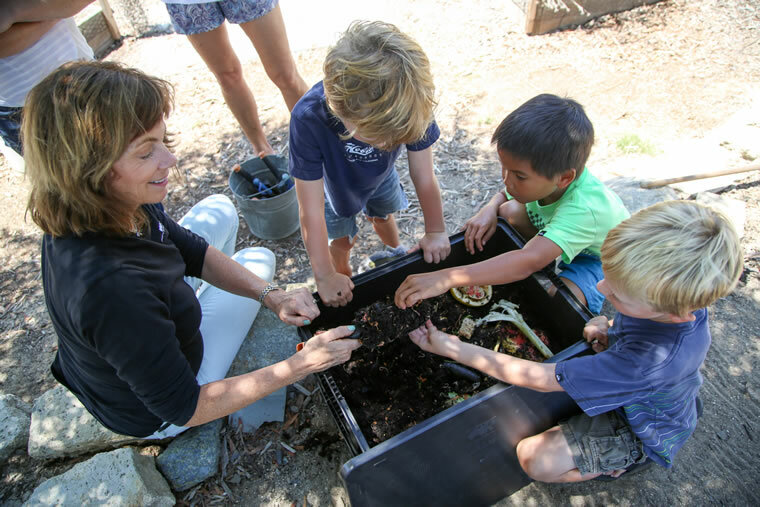 Lisa Ryder (pictured) leads family-friendly composting workshops around town. With most drought-tolerant plants, you need to water four times a week for the first week and then once or twice a week until the plants are established, depending on the specific variety. Composting is a great way to make the water last once the soaker hose or sprinkler is turned off, as it’s absorbent and reduces evaporation. A creative and fun way for the family to create compost is to start a “wriggly ranch” worm compost bin, as worms produce a liquid fertilizer called worm compost tea. I recently signed up for a free workshop led by Lisa at Bluebird Park, joining a group of parents and kids in learning how to assemble worm ranches and feed our kitchen waste to a pound of hungry red wigglers. “Mother Nature cleans my house and feeds my children,” says Lisa, who has reduced her family’s weekly trash output to a small bag. Even though I’m a worm-fearing mom, Lisa’s enthusiasm convinced me to give worm wrangling a try. I bought a ranch and set it up in my kitchen—the assembly process was easier than anything from Ikea. Three days later, I received a box filled with a pound of worms. I emptied them into the top rack and they quickly burrowed into the provided coconut fiber. Just like a new pet, I want to make sure my wrigglers felt at home, so I kept the ranch in my kitchen until they started eating up my old bread and veggies scraps. Once they settled in, I moved them to our outside patio. They are odorless and fun for kids (and adults) who like to play in the dirt. The ranch also gives off a fresh smell, almost like a rainforest. 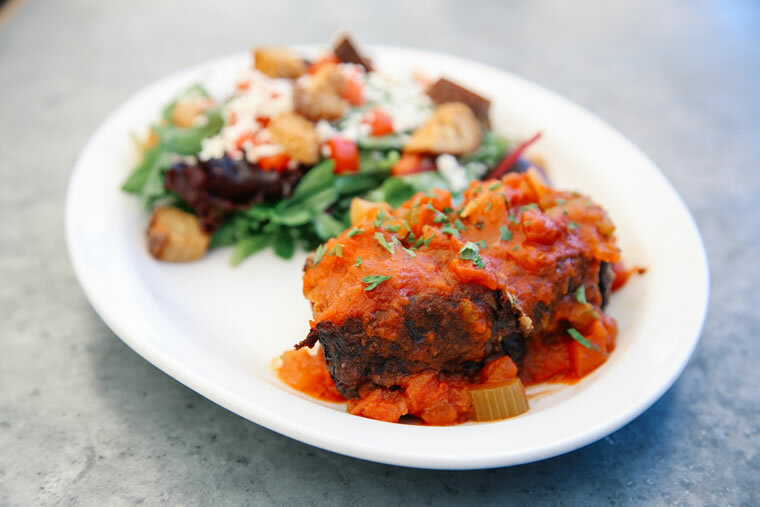 Try Zinc Café & Market’s mushroom nut loaf for a “meatless Monday” meal. While the kids are busy checking out the worms, think about sneaking in a weekly Monday dinner without meat. Beef has the highest water footprint out of all the animal proteins. According to the Orange County Water District, one 8-ounce steak takes 1,232 gallons of water to produce. John Secretan, owner of Zinc Café & Market, suggests starting with something like pasta marinara or black bean chili. My youngest daughter loves the restaurant’s black bean chili and garlic knots; over a year passed before she realized it was vegetarian. “If you don’t make a big thing about it and just slowly eat vegetarian every Monday, they won’t miss it,” John says. The mushroom nut loaf, one of Zinc’s most popular items, is also a wonderful substitute for meatloaf and has meat-free gravy. My teenage daughters, who have already been well educated on the five-minute shower, explain it’s now hip to do the ‘no-poo program.’ I was a bit scared until I realized they meant ‘no shampooing of the hair.’ Some stylists say shampoo strips the hair of essential oils while also wasting water. We tried it for a couple of weeks and found that this trend is actually based on fact. It seems the less you wash your hair, the less oily it appears. I have stuck with the program and only wash my hair with shampoo once or twice a week. Another fun conservation activity to try at home is the yellow flag game. The water district gives out yellow flags that can be placed in the ground to notify a homeowner that they have water runoff into the street, a broken sprinkler head or an irrigation system that is overwatering. Grab a bunch of flags from the water district and send the kids out on a yellow flag mission. The one that returns with the least number of flags wins a prize. This is a helpful and nonthreatening way to help our neighbors from going over their water budget and possibly getting fined. I even carry the flags with me now while walking my dog. For the older kids, why not challenge them to work on a cheaper form of desalinization for ocean water? It’s an engaging and educational project, and one never knows what inventions could be created in a garage. 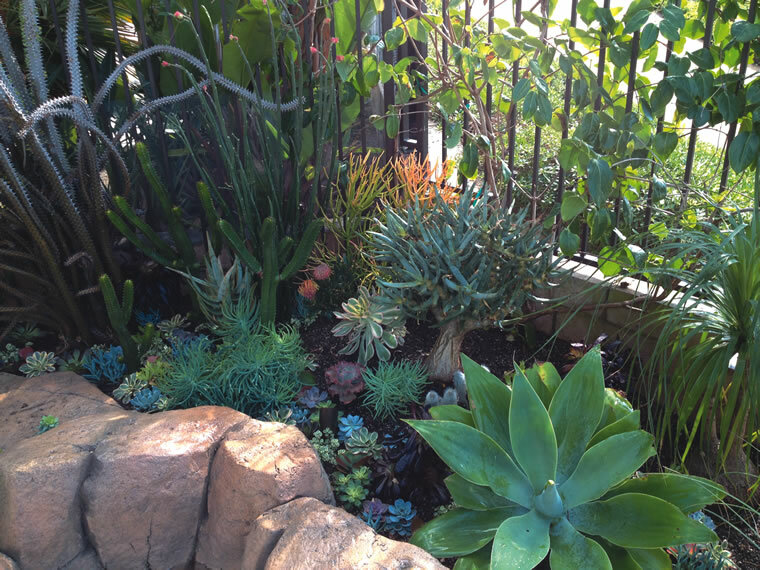 Laguna Beach Water District’s new rules for winter watering went into effect Dec. 1. Residents are now permitted to use their outdoor landscape sprinklers one day per week (down from two), only on Mondays before 8 a.m. or after 8 p.m., with a maximum of 10 minutes per sprinkler station/zone with no run-off water. However, the 10-minute limit does not apply to some water-efficient irrigation systems. The existing drought regulations will also continue. The restrictions are intended to help the city meet mandatory goals while ensuring a reliable water supply. In order to reach the state’s requirements, Laguna Beach must reduce its water use by 24 percent, or 200 million gallons, by March 2016. But the district expects that there will be less to cut back on this season: With lower temperatures, shorter days and a strong chance of rain from El Niño, landscapes shouldn’t require as much water. Complete details are available at lbcwd.org.